Congratulations to "Joan V.", the winner in Shelley's giveaway. Thank you to all who participated! 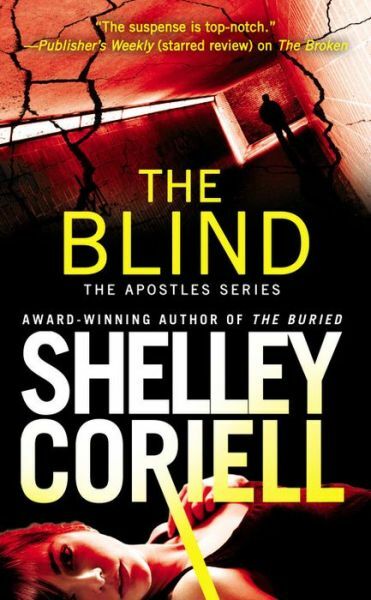 In my latest romantic thriller, THE BLIND, a serial bomber uses bombs and live models to recreate masterful art that lives and with the flip of a switch...dies. A pretty dark and twisted soul, no? Which means this book needed a hefty dose of light. Enter art. While I don’t have a tattoo, this book got me thinking about getting one. On Twitter the other day, I saw a fairy tattoo made out of a semi-colon. Loved it! So simple and symbolic. I also love the idea of a single word...perhaps JOY or PEACE. What about you? Do you have a tattoo or a secret yearning to get a one? Tell us in the comment section below. As part of the FBI's elite Apostles team, bomb and weapons specialist Evie Jimenez knows playing it safe is not an option. Especially when tracking a serial killer like the Angel Bomber. He calls himself an artist—using women as his canvas and state-of-the-art explosives as his brush. His art lives and breathes . . . and with the flick of a switch . . . dies. As the clock ticks down to his next strike, Evie faces an altogether different challenge: billionaire philanthropist and art expert Jack Elliott, who's made it clear he doesn't care for Evie's wild-card tactics. “Discuss later,” he said against the hollow of her throat. “It was a message for one.” His entire body stilled for a handful of endless seconds before he unfastened the button of his dress pants, the fabric falling and exposing the full tattoo. Shelley Coriell is an award-winning author of romantic suspense and novels for teens. Her debut romantic thriller, The Broken, was named one of Publishers Weekly’s Best Books of 2014, and the second book in the Apostles Series, The Bruied, was nominated for a 2015 ITW Thriller Award for Best Paperback Original. An avid foodie and former restaurant reviewer, Shelley lives in Arizona with her family and the world’s neediest rescue weimaraner. You can find her online at www.shelleycoriell.com and Twittering @ShelleyCoriell. GIVEAWAY: Leave a comment below and enter the Rafflecopter to win signed copies of the entire Apostles Series: THE BROKEN, THE BURIED, or THE BLIND! I don't have a tatoo but when I was much younger I did want one. Unfortunately, I was always to chicken of the pain. Last year I had a friend get a tattoo on her ankle. She said the pain was worse than childbirth. Yikes! No tattoos, and no desire for one. Fake works for me! So do hennas. I've seen some exquisite henna work on feet. No tattoos and probably won't get any. Not that I'm opposed to them, I just couldn't think of anything that would be meaningful and that i wouldn't regret :) thanks for sharing! Exactly! What is important now might not be ten years down the road. My niece just had a "cover up" tattoo done on a tat she no longer liked. Good news is the new tattoo looks amazing. I will admit to not trusting anyone enough to put a tattoo on my body... I would pick out any flaw I saw and be annoyed it would be there forever. I never thought about the trust element...but great point. Where people place tattoos is almost as interesting as the art itself. Like you I'm not sure what part of me would be the canvas...maybe inside of right wrist...not obvious but visible to those I let in my personal space. No tattoo, no desire for one. I have never wanted a tattoo. I do admire some on others though. I've been on vacation all week and saw a woman at the beach with a lacy angel wing tattoo on her back and shoulders. Definitely not for me, but it was beautiful on her. I don't have a tattoo and don't plan on getting one. I like them on other people as long as they don't cover an entire arm or large sections of the body, but don't want one myself. In THE BLIND, there's a scene in a tat shop where Evie is investigating a lead, and she talks with a woman getting a dragon tattoo down her back and legs. When I was researching this scene, the tattoo artist I interviewed told me that kind of tattoo would take multiple sessions and more than 30 hours. I can't imagine enduring pain and sitting still that long! Hi, I don't have a tattoo, but I have thought seriously about getting one. I would get a thunderbolt with 11-12-2002 centered under the thunderbolt. (I am a stroke survivor. The international sign for stroke is a thunderbolt. The date of my stroke was November 12, 2002. Thanks for sponsoring this giveaway and for the opportunity to participate. Love this, Alexa! Continued good health and good luck in the giveaway! I occasionally think about getting a tattoo but I doubt if I will. Many of my friends and a few family members have them though. I was so disappointed that Forever turned down my review request for this but it's on my wish list! I'm sure I'll enjoy it. Bea, I have a few ARCs left. If you don't win and don't mind a paper copy, contact me through my website, and I'll pop one in the mail. Joy & Peace! I don't have a tattoo and don't want one.